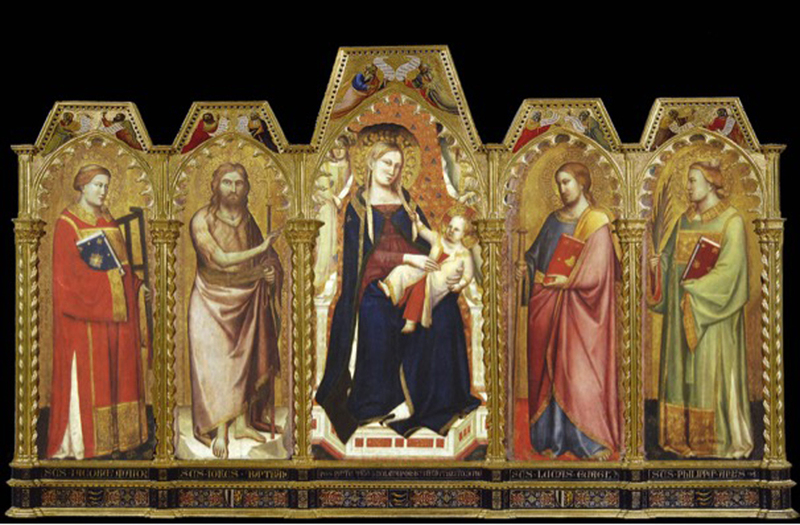 George Bisacca, Senior Conservator at the Metropolitan Museum of Art, considers the stylistic transition from the frame of the Gothic polyptych to that of the Renaissance altarpiece. This paper was given as a presentation at the Frame Study Day, National Gallery, London, on 15th May 2015. Just what is going on here? Something is obviously wrong. 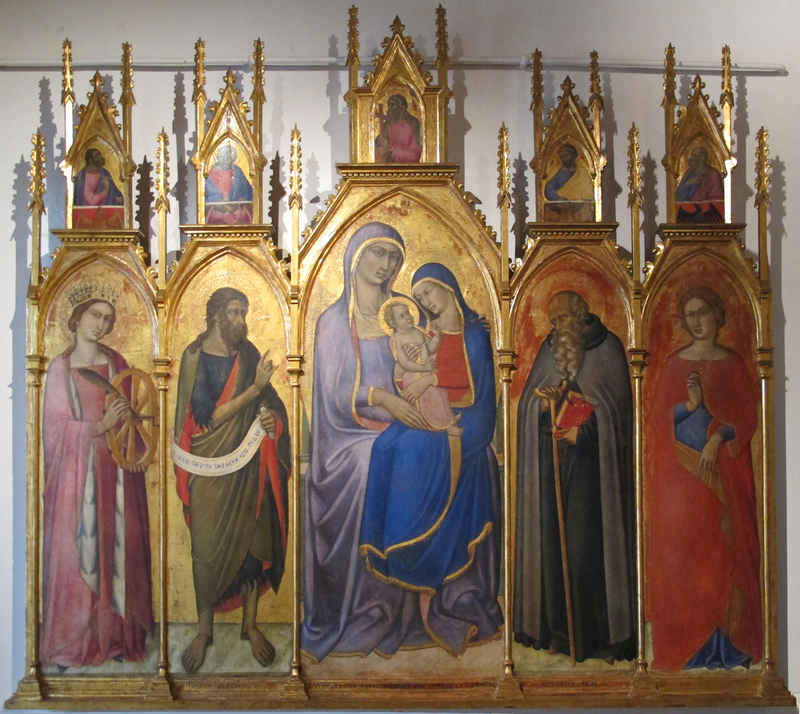 This is an altarpiece at the Metropolitan by Taddeo Gaddi of around 1340, but it has been radically altered sometime in the last quarter of the 15th Century. Taddeo Gaddi, details of altarpiece. There are two incompatible aesthetics at work here. The rigidity of the standing Gothic figures has little to do with the relaxed poses of the Renaissance figures of the Evangelists, who hook their elbows over the fictive lilac framing elements; or the decorative pilasters, too worldly for the austerity of the standing Saints. 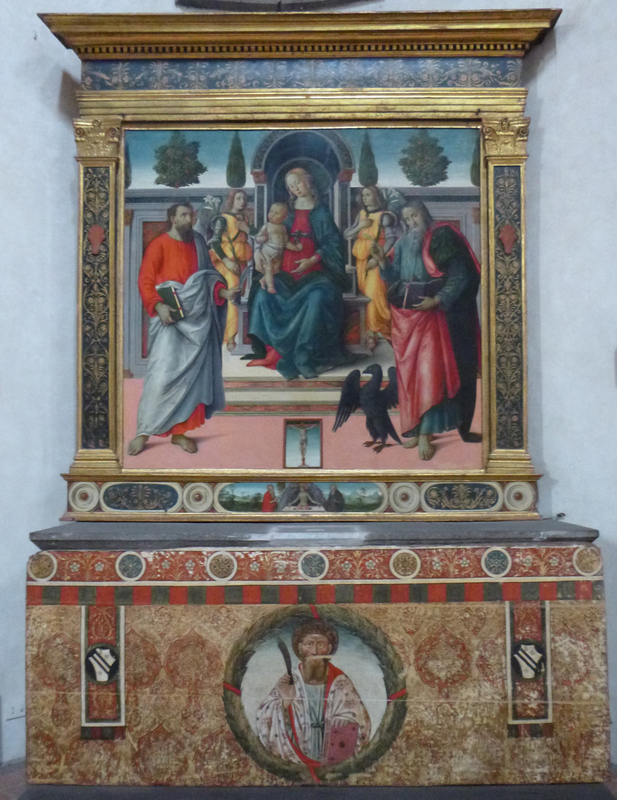 The Gaddi altarpiece, of course, would originally have looked very different. We can get some idea if we examine some of the relatively unaltered examples of his work. 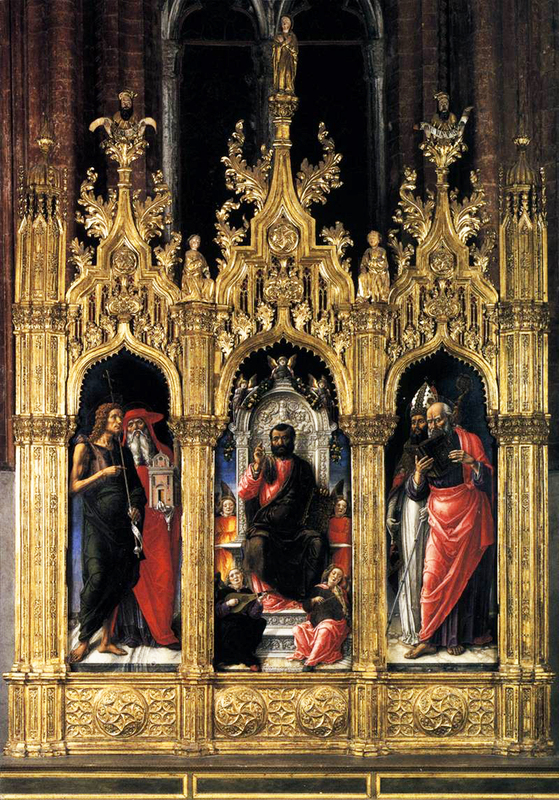 Here, for instance, is an altarpiece by Gaddi from the church of Santa Felicità in Florence, which retains many of its original framing elements. 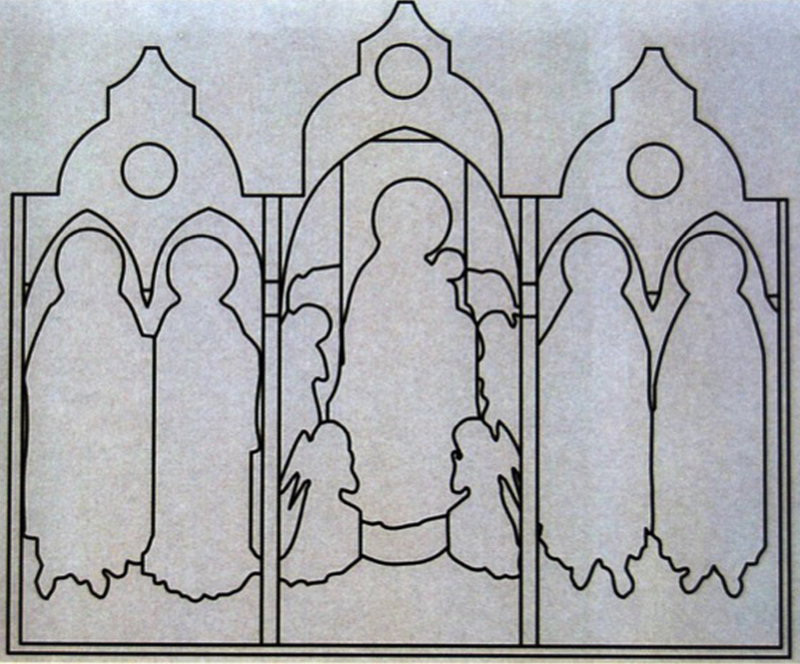 We might superimpose on this Gothic altarpiece the figures from the Metropolitan Gaddi; although the effect is still not as it would have looked when completed, because the flat tops of the panels would also have had painted pinnacle panels with finials. 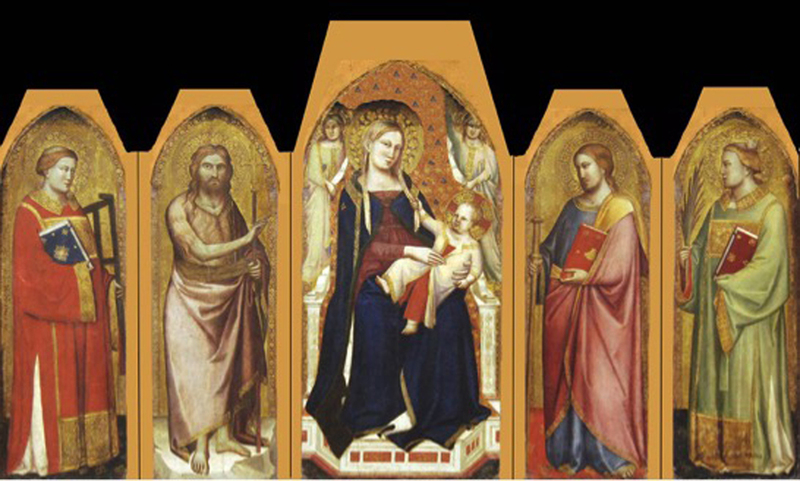 This largely intact pentaptych by Luca di Tommè gives a better idea of the whole Gothic structure of a 14th century altarpiece. 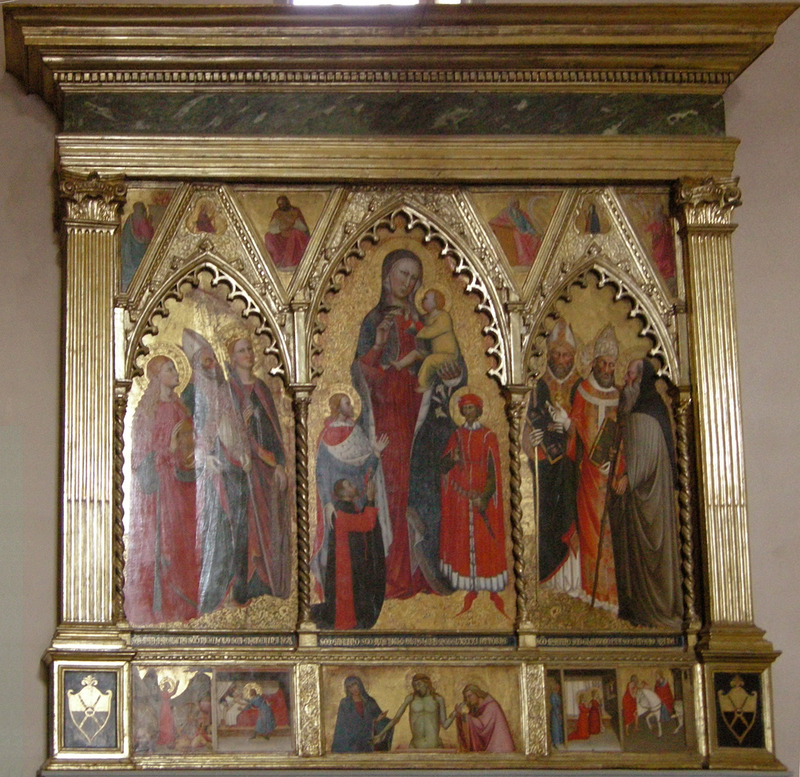 We can see another representation of a complete mediaeval altarpiece, including the side buttresses, in this wonderfully accurate fresco of a polyptych by Lippo Vanni in San Francesco in Siena. They’re not exactly analogous, but this gives an idea of the verticality of the Gothic altarpiece, with gabled tops and finials, which dominated the entire Trecento in Italy. The alteration of the Metropolitan’s Gaddi in the late 15th century would first have entailed the removal of the gables and finials. … and then these spandrel areas were painted, and Renaissance pilasters added, to replace the original carved colonets. Finally an imposing entablature frame was added, with fluted and reeded pilasters. Now, why would the Metropolitan dedicate so much precious wall space to something that has been so compromised, so radically altered? 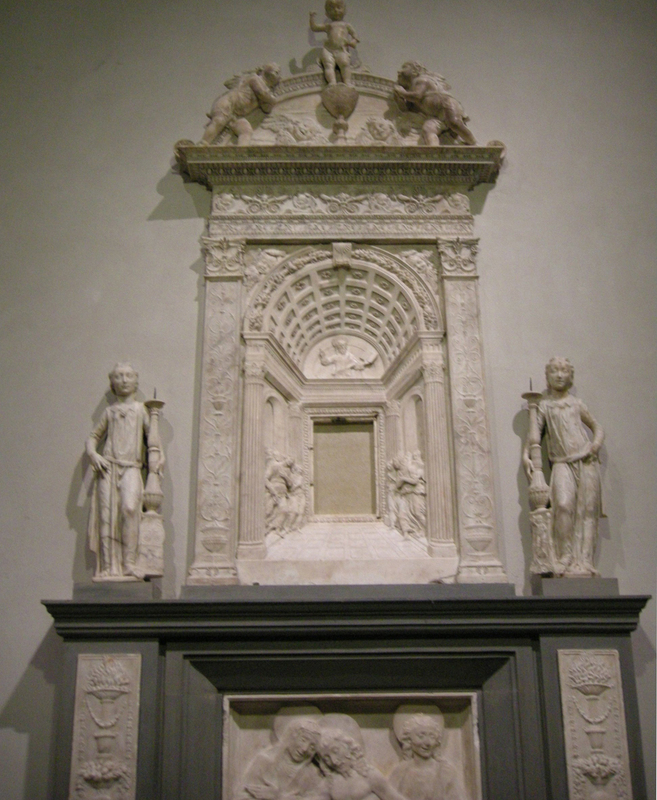 I would like to propose that, rather than focus on its compromised aesthetic, it can be seen as an exceptional example, unique in the United States, of the profound shift that occurred in Florence in the second and third decades of the fifteenth century. That shift can be considered perhaps one of the most, if not the most, fundamental and rapid changes in the history – not only of framing – but of architecture as well. It began in Florence and quickly spread throughout Italy and then the rest of Europe – and the reverberations are still being felt to this day. The man who set this change in motion, almost single-handedly, was Filippo Brunelleschi. 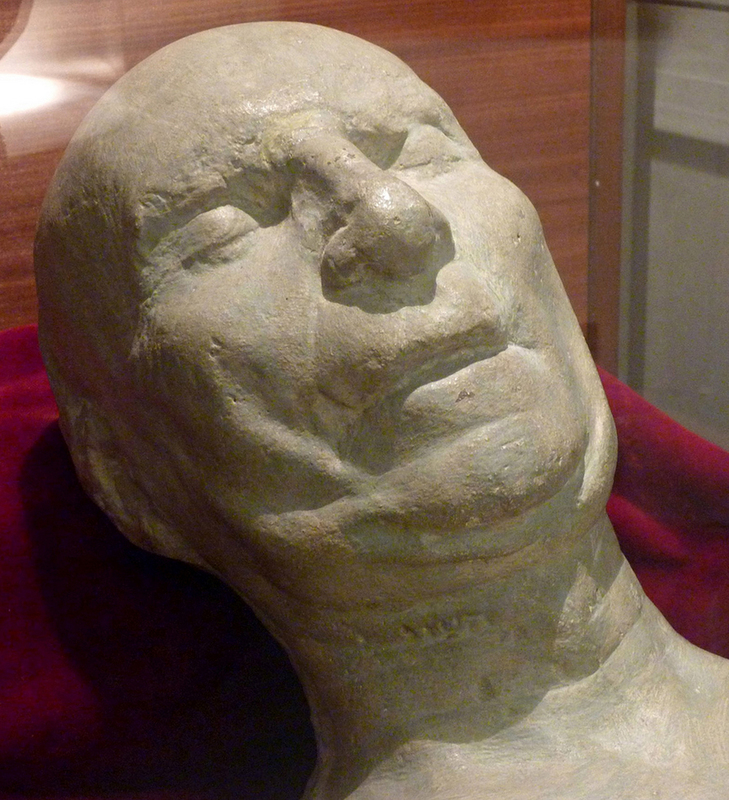 This is the mask made at the moment of his death in 1446, conserved at the Museo dell’Opera in Florence. 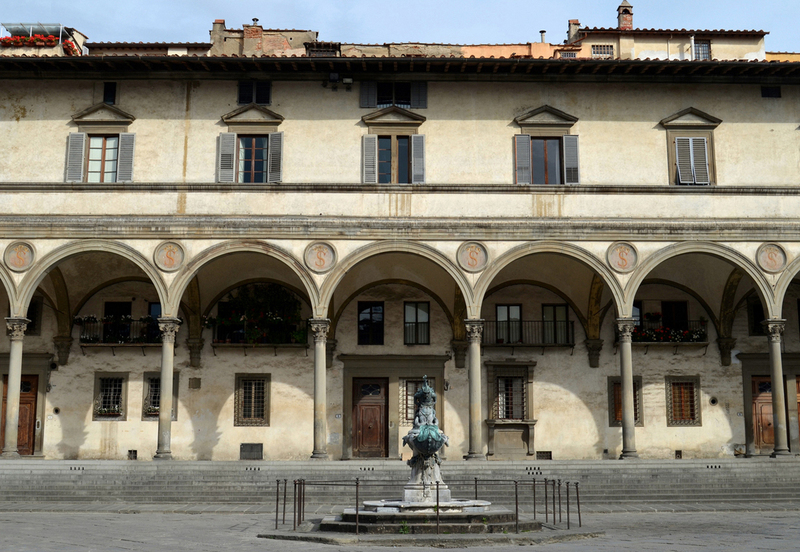 Brunelleschi began construction on the Ospedale degli Innocenti in 1419, and it is considered the first building of the Renaissance to transpose a classical vocabulary onto a public and ecclesiastical building. Vasari tells us that Brunelleschi was so taken by a description recounted to him by Donatello of his recent trip to Rome and the ancient ruins he had seen there, and in particular the carved figures on a Roman sarcophagus, that he is said to have set out almost immediately and walked to Rome to see for himself. He remained there for three months studying the ruins. He did not slavishly copy the classical forms but assimilated the vocabulary and imbued it with a greater metaphysical sense of pure geometric proportion. 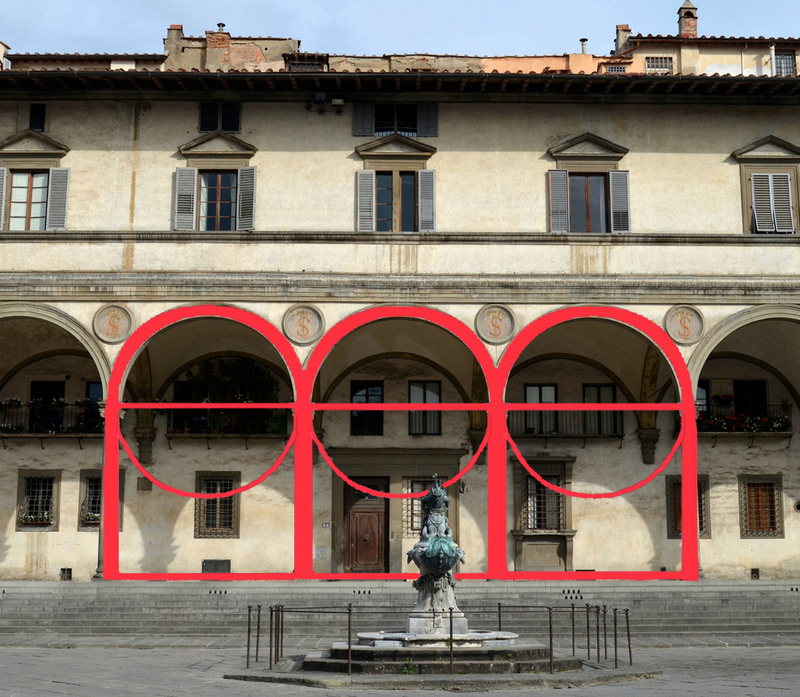 In the case of the Innocenti, the height of the columns is equal to the spread of the arch, making a perfect square, and again equal to the distance to the back wall of the arcade, forming a perfect cube. Each bay is surmounted by a hemisphere dome, then, half the height of the square. 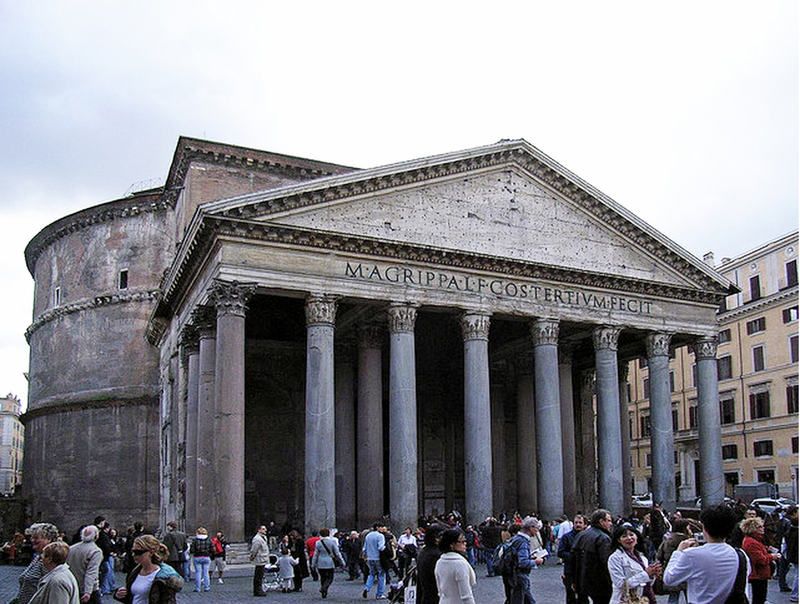 …and, of course, the Pantheon, already stripped of most of its marble cladding, but thereby revealing its underlying structure. 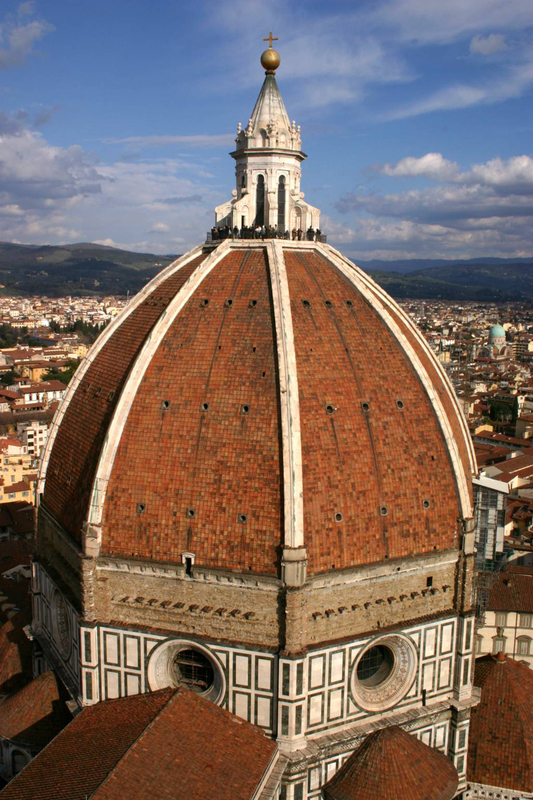 Such examples became critical to his understanding of masonry, making possible the construction of his matchless dome. 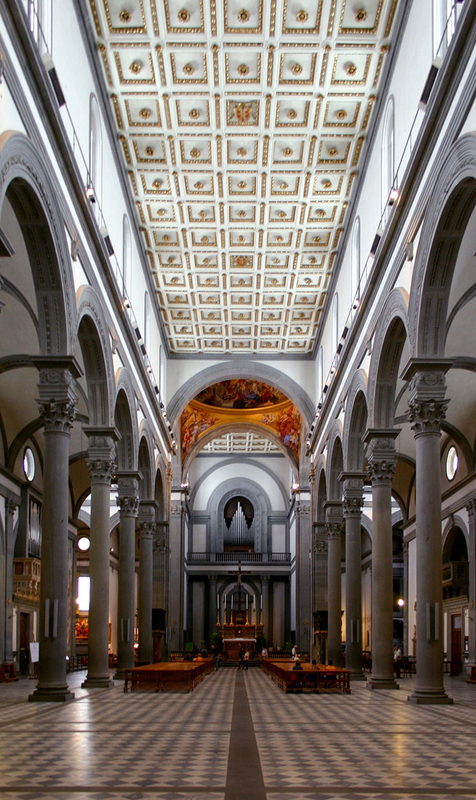 At the same time that the Innocenti and the Cupola were beginning to rise, ground was broken on the Medici’s parish church, San Lorenzo, for which Brunelleschi is known to have ordered rectangular altarpieces in 1425. 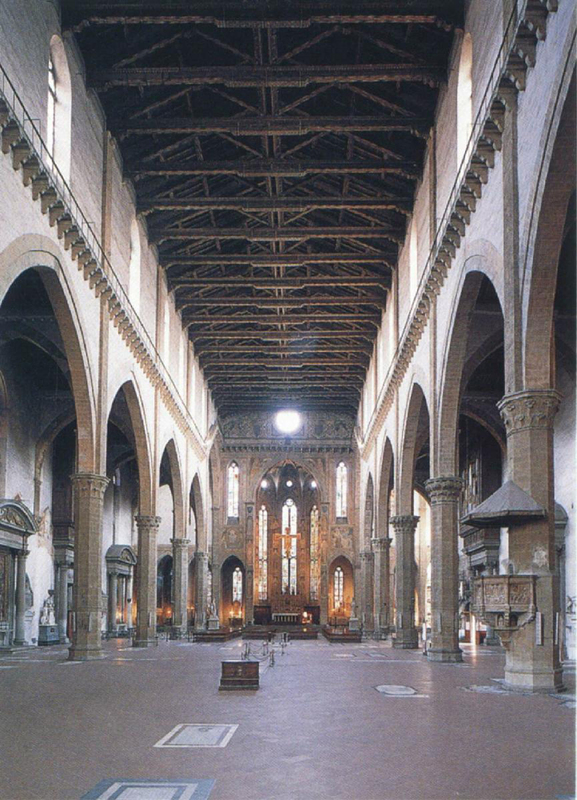 Then came the church of Santo Spirito, planned in 1434 but not begun until ten years later, two years before Brunelleschi’s death. 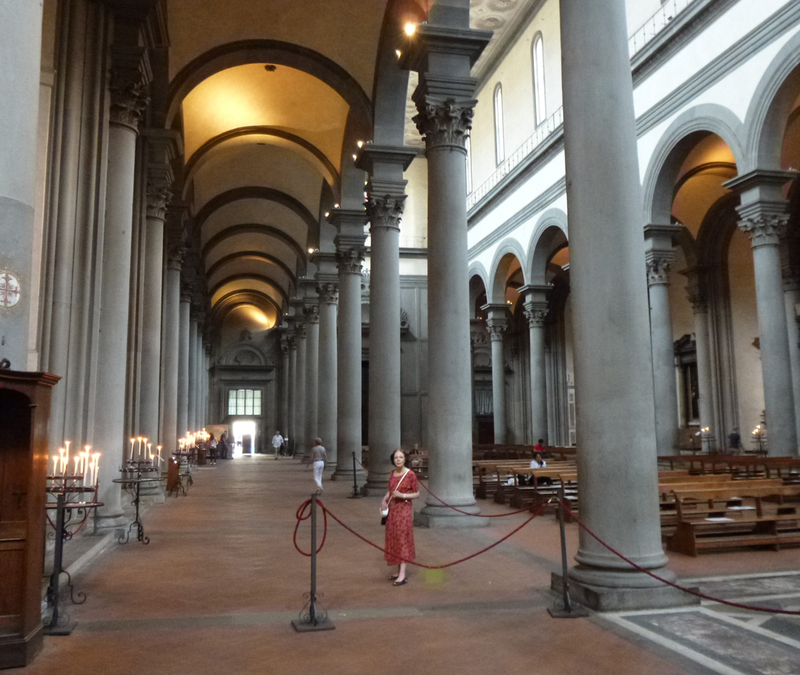 Considered the most symmetrical of churches, the columns of the nave continue around the transepts of Santo Spirito, creating individual chapels. 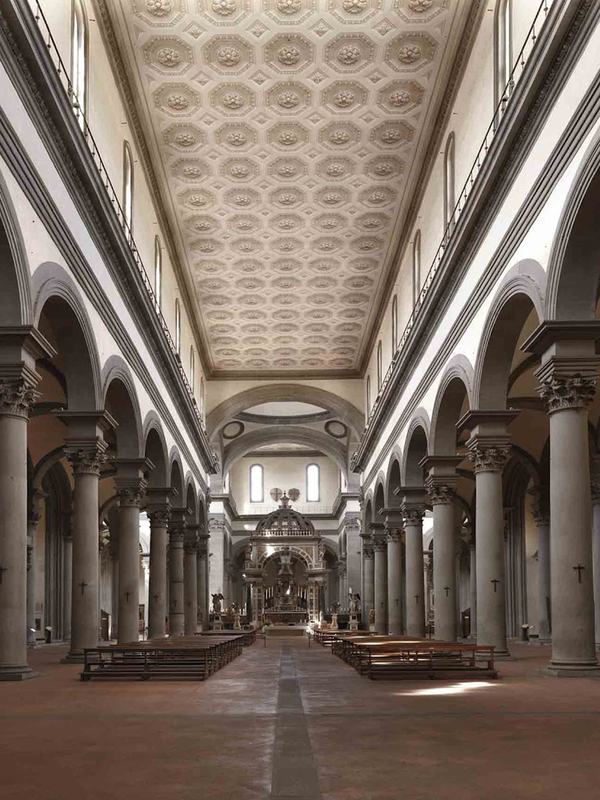 Nothing less than a sea change was occurring – as can be seen if we compare Brunelleschi’s churches with the austere gothic interior of Santa Croce. 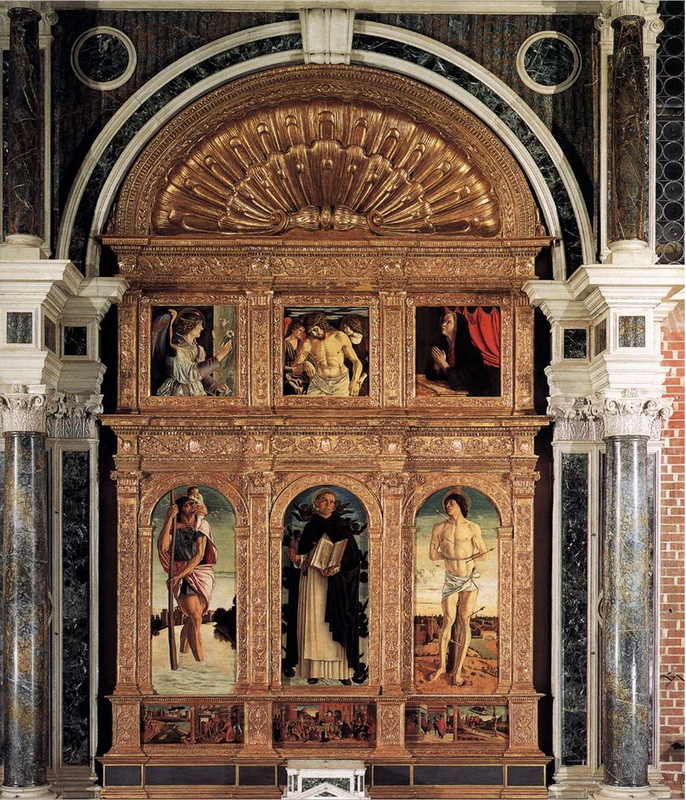 As the surrounding architecture modernized to the new Renaissance classicism, many altarpieces were logically updated as well. 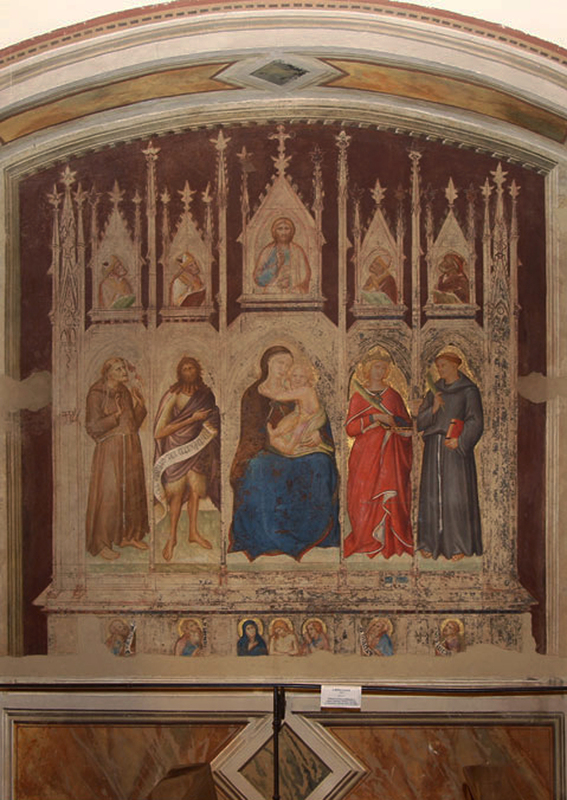 Gothic altarpieces might be retained and modified because they held a particular significance or value, as with the reframing of Giotto’s Coronation polyptych in the Baroncelli chapel at Santa Croce. 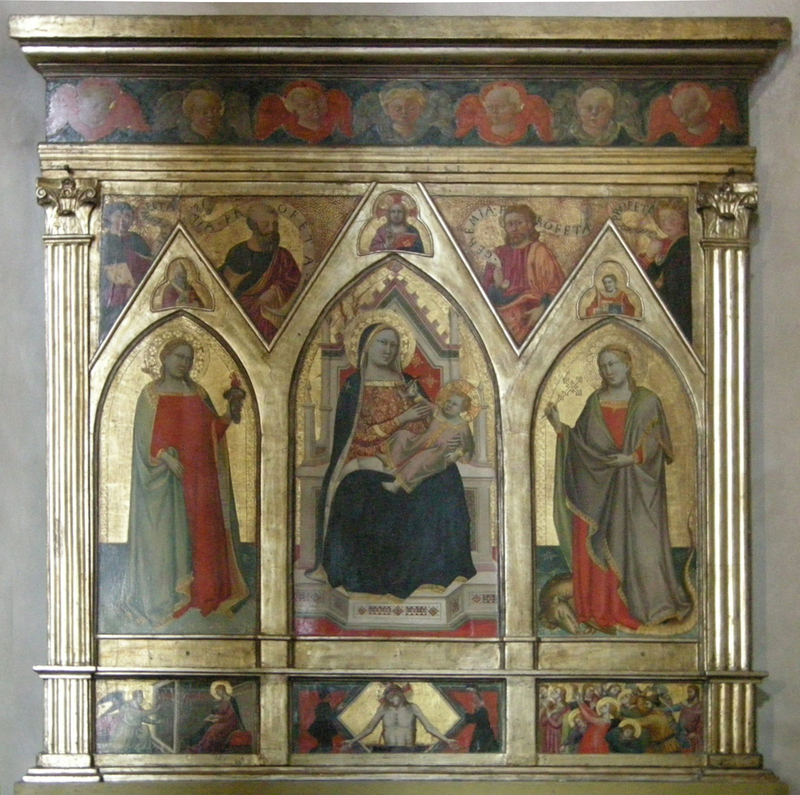 The San Domenico Altarpiece by Fra Angelico at Fiesole was similarly modified; in this case the polytych was turned into a rectangle, and the background repainted by Lorenzo di Credi. 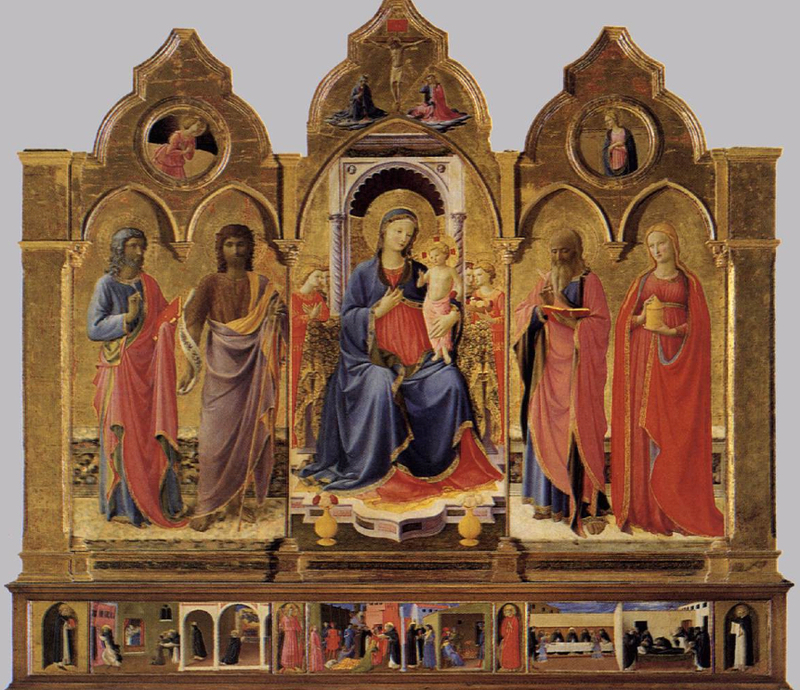 The configuration of Fra Angelico’s original polyptych must have been shaped like a contemporary polyptych by him at Cortona (which has lost its finials). 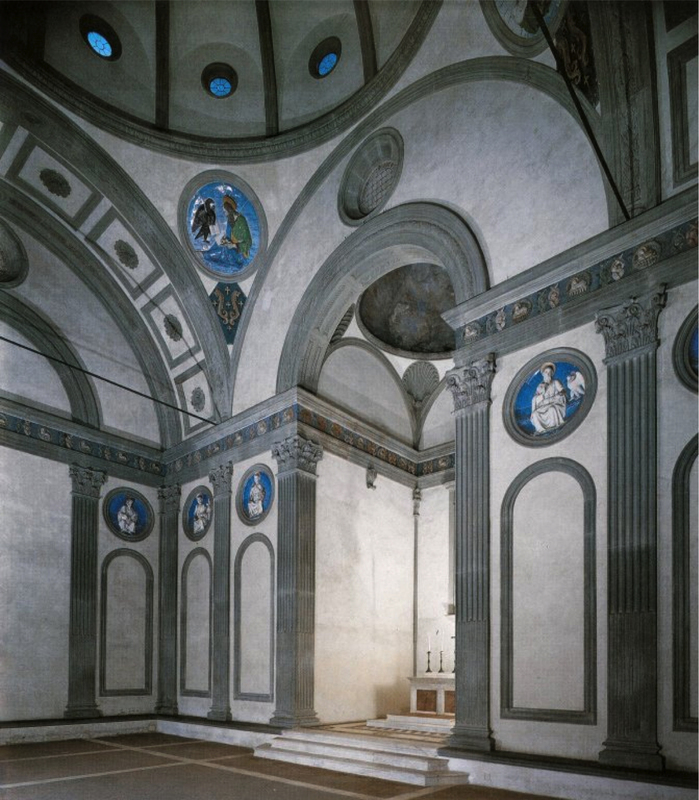 Other examples may have retained the earlier paintings simply as a cost-saving measure, like the example (above) from San Martino a Mensola, north of Fiesole. 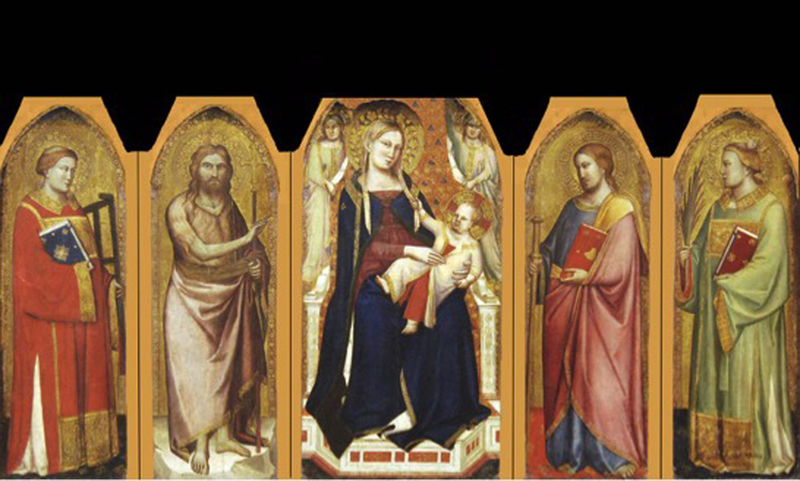 The unknown Master painted the panel in 1381 and it was modernized in the third quarter of the 15th century. 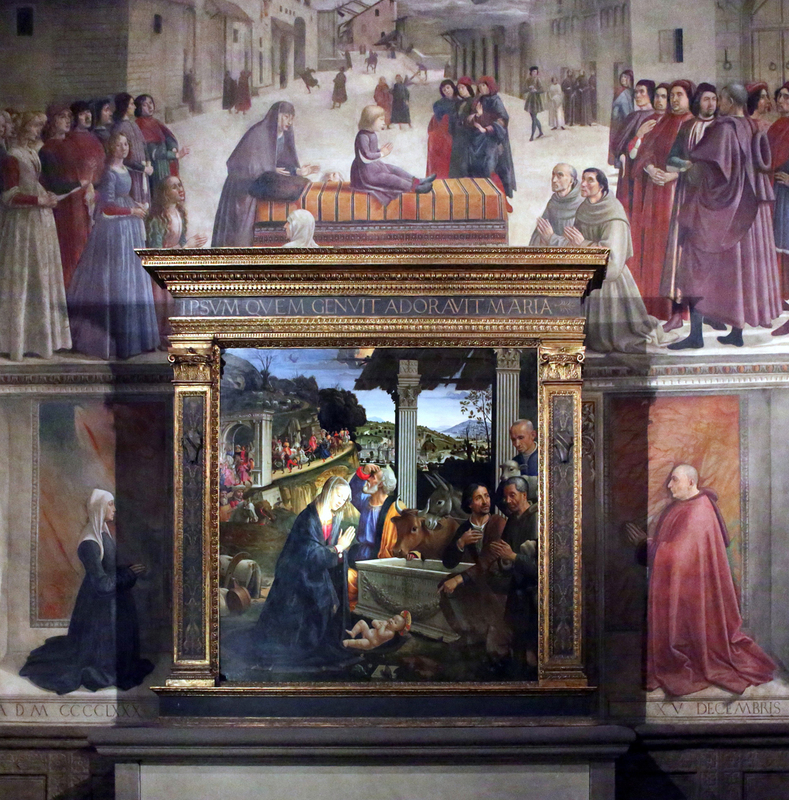 All three altarpieces in the church received a similar treatment. 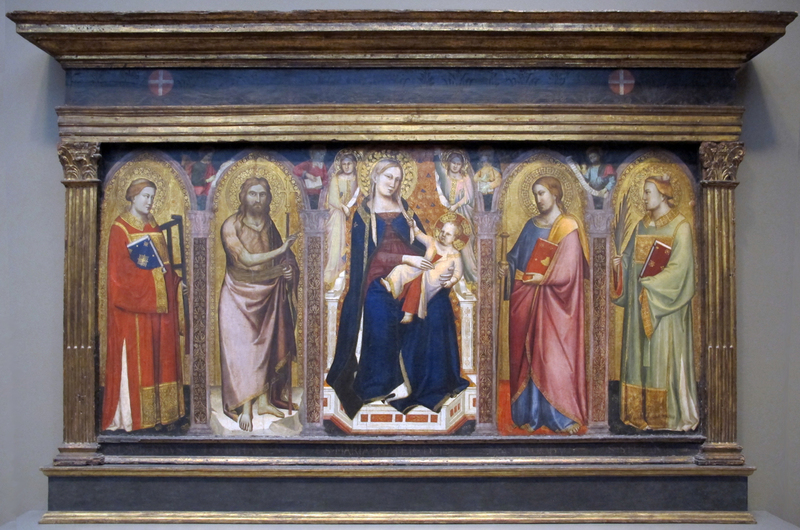 In fact, one of the others also happens to be by Taddeo Gaddi, like the Metropolitan’s panel. During this transitional phase, many artists and panel-makers with a less sophisticated understanding of correct classical detail and proportion produced very curious conflations of Gothic and classical elements. 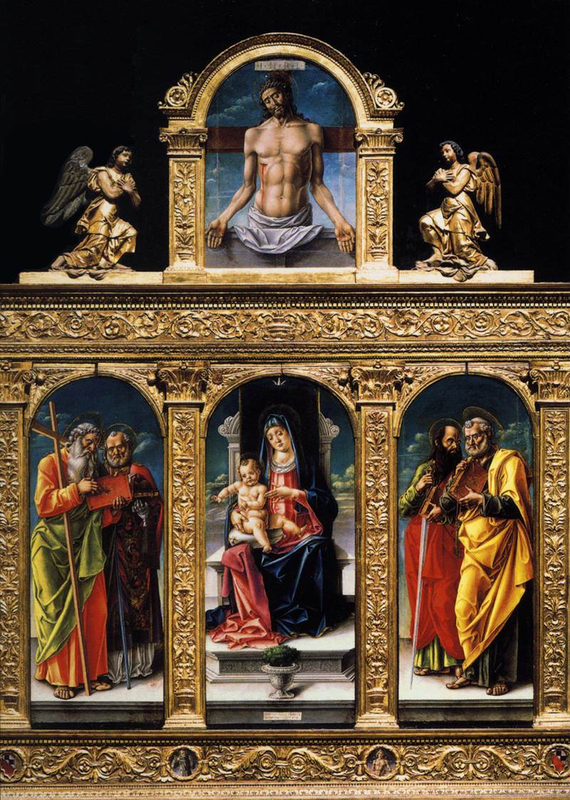 In the Pala di Ripalta, above, by Andrea di Giusto, currently in the storerooms of the Uffizi, the pointed arches have been rounded and additions have been made above the gables, to adapt it to the new all but obligatory rectangular format, but basically it’s a Gothic altarpiece. 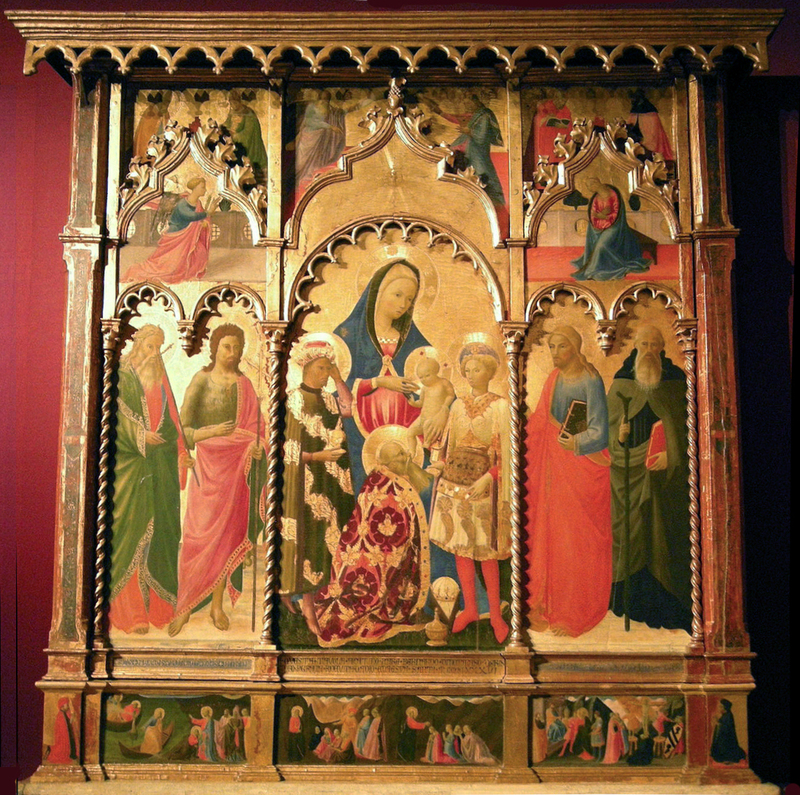 This is another example, also by Andrea di Giusto, painted in the following year (1437), now in the Accademia in Florence. The colonets have been eliminated and the design is more open, but the triptych organization still persists – albeit with some rather squashed interrupted ogees. 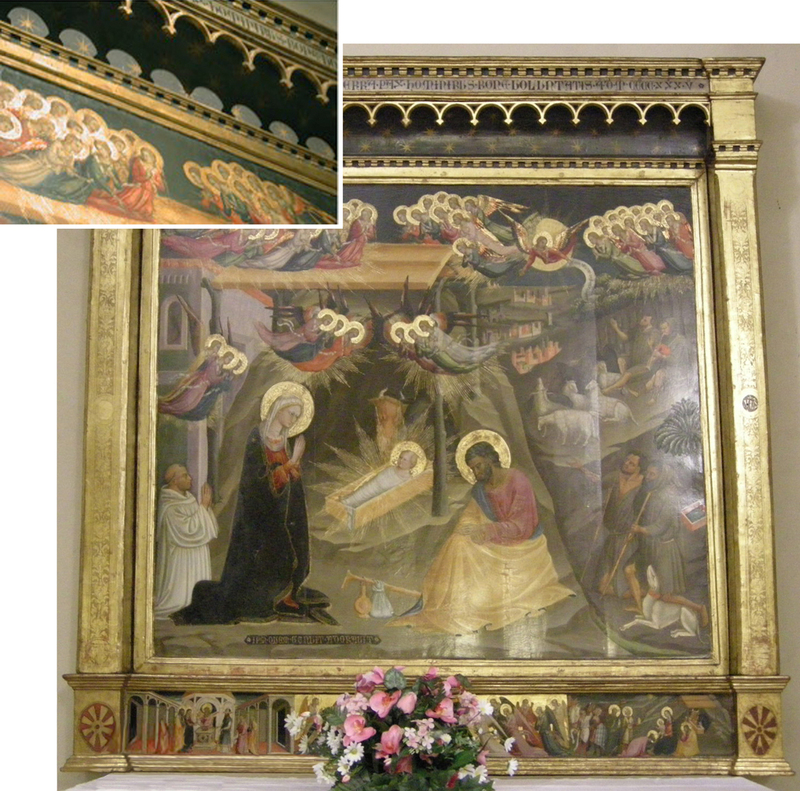 The curious overhang (also present in the previous example), which functions almost like a baldachin, is present in other transitional works. 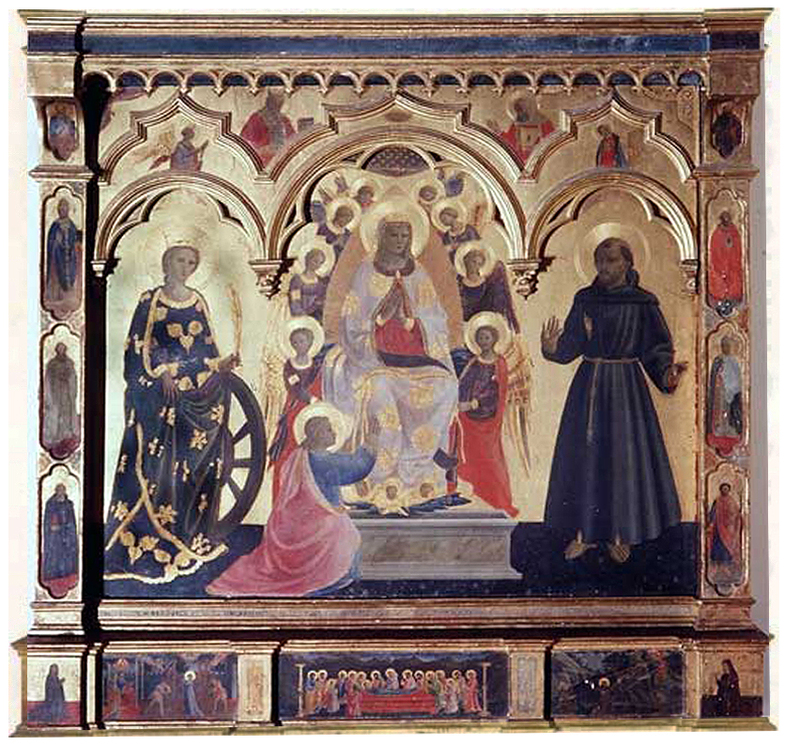 This altarpiece by Bicci di Lorenzo of the 1430s in the church of San Giovanni dei Cavalieri in Florence incorporates the same device. 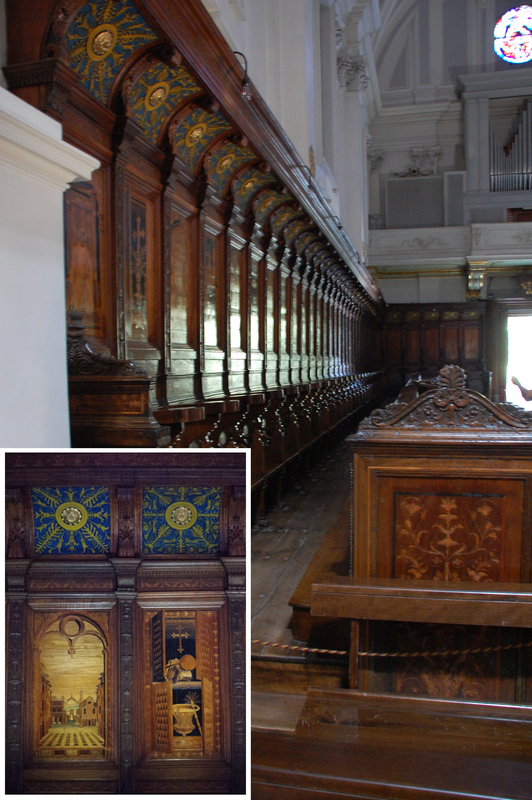 It derives from the supracelia of choirstalls like these, from Monte Oliveto Maggiore, south of Siena. 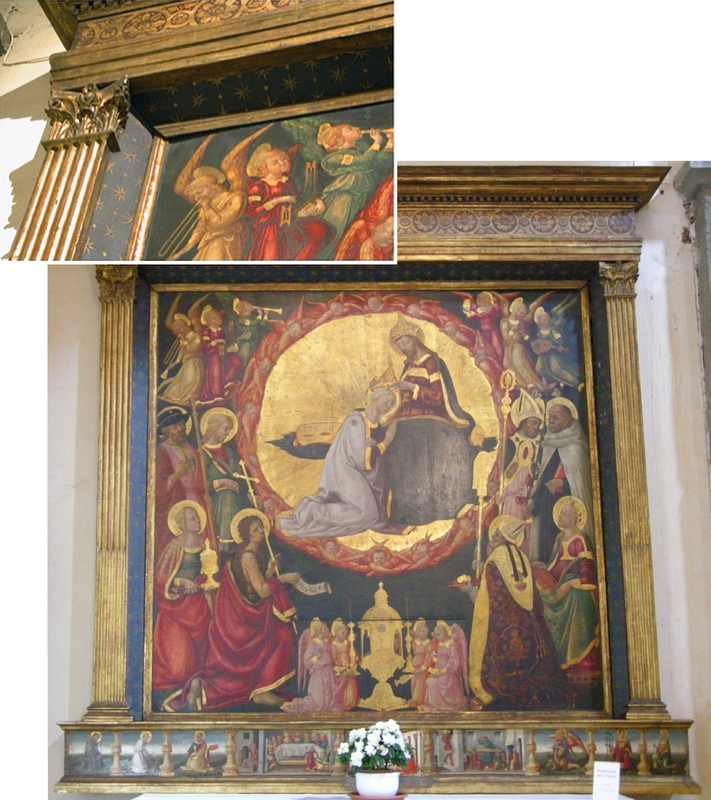 Another altarpiece by Neri di Bicci in the same church runs this element, with gold stars on a blue field, around three sides of the painting. 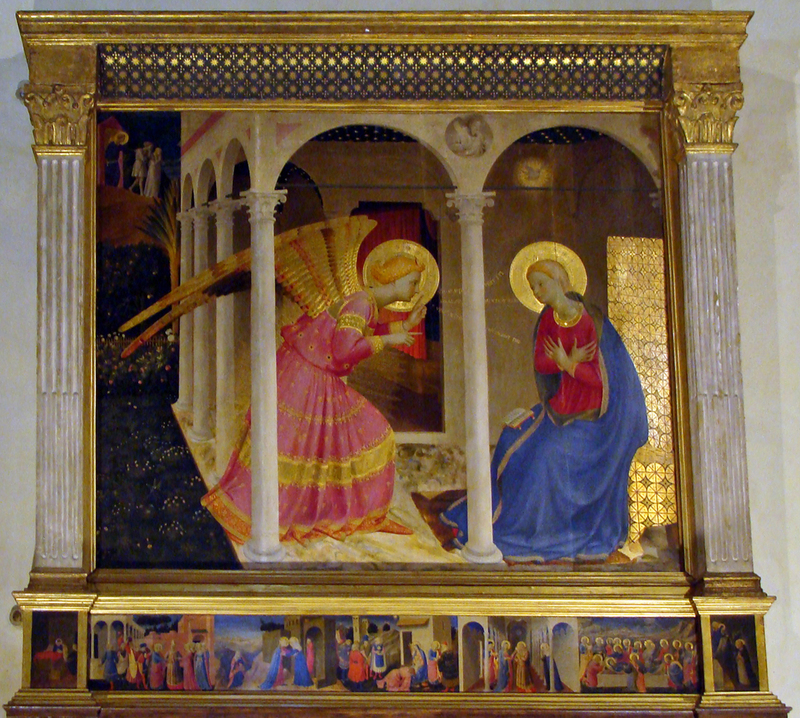 The solution in Angelico’s Cortona Annunciation of the early 1430s moves closer toward a proper entablature, but still retains the curved supracelium instead of a proper frieze. This Coronation of 1430 by Bicci di Lorenzo at Santa Trinità also doesn’t completely escape the Gothic idiom by incorporating a gabled entablature. The construction here is still very Gothic in that the panel extends nearly to the edges, and all framing elements are attached flat against the face of the panel, as you can infer from the oblique image of the reverse at the bottom left, above. Michelozzo di Bartolomeo (1396-1472), Sant’ Agostino (from 1285; façade 1437-39), Montepulciano, Siena. 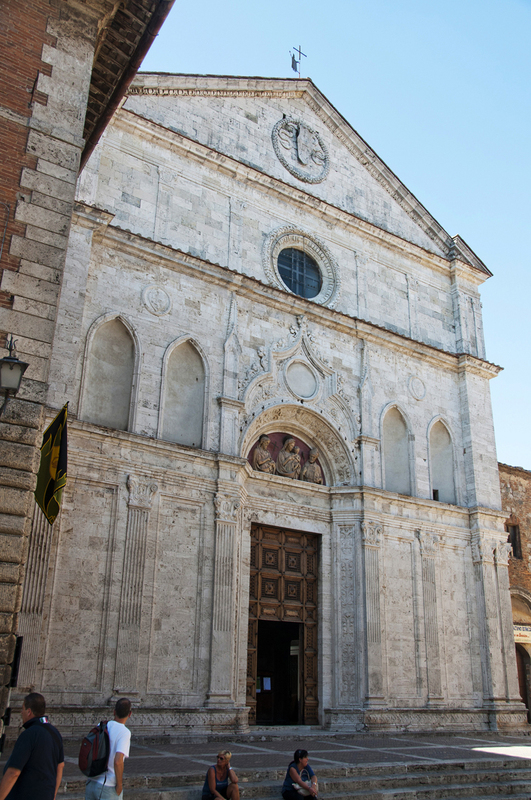 It should be noted that even pre-eminent architects struggled with this transition, as we can see here with Michelozzo’s façade for the church of Sant’Agostino in Montepulciano of the 1430s. The first storey, with classical pilasters and entablature, sits uneasily beneath the Gothic crest of the tympanum, and the row of blind pointed arches. 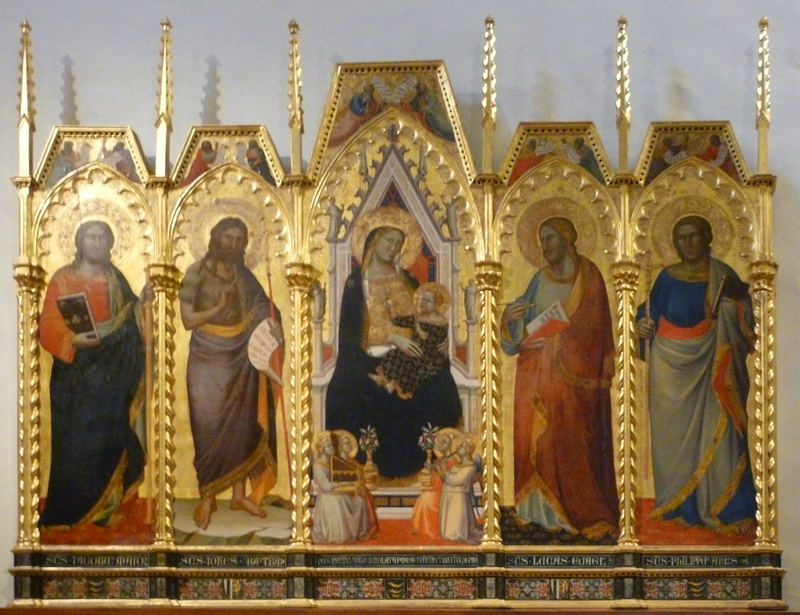 A much purer use of a classical vocabulary is illustrated by a small group of five altarpieces of similar size and proportion but individualized detailing, displayed in the west transept of Santo Spirito in Florence, which very probably reflect Brunelleschi’s own original designs – although they were only built between the 1460s and 1480s. 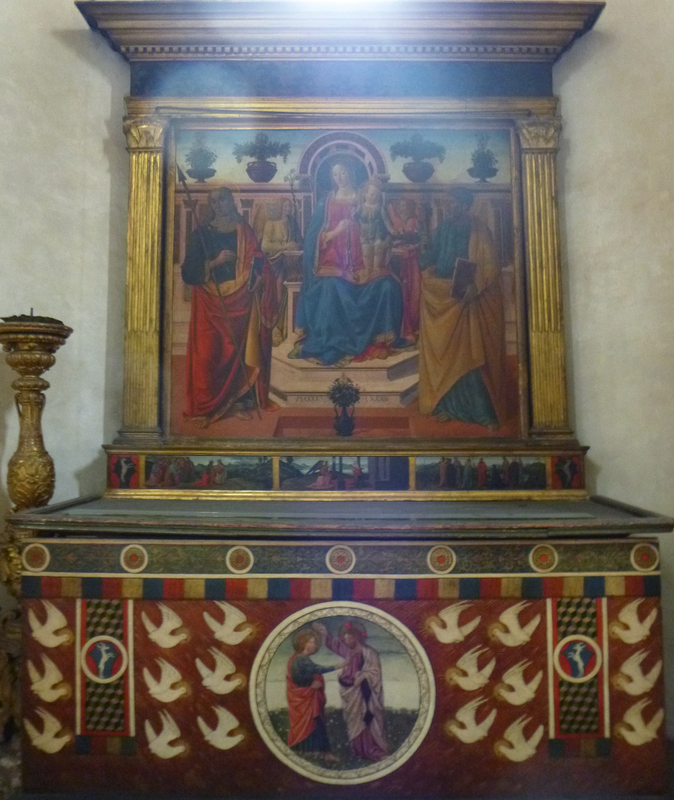 Most of the paliotto panels below the altars are 15th century as well. These designs clearly show the more accurate architectural or structural underpinnings of Renaissance classism, when compared with the more superficial or decorative elements in previous examples. 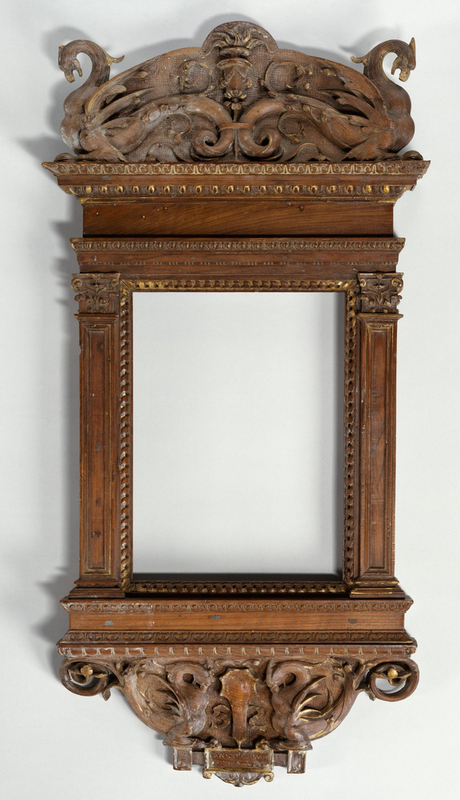 The proportions of these frames were similar to those of the frame on the Taddeo Gaddi in the Metropolitan with which this piece began, and so we used the base of the Botticini frame (above) in Santo Spirito as a source to complete the predella of the Gaddi, which was missing. 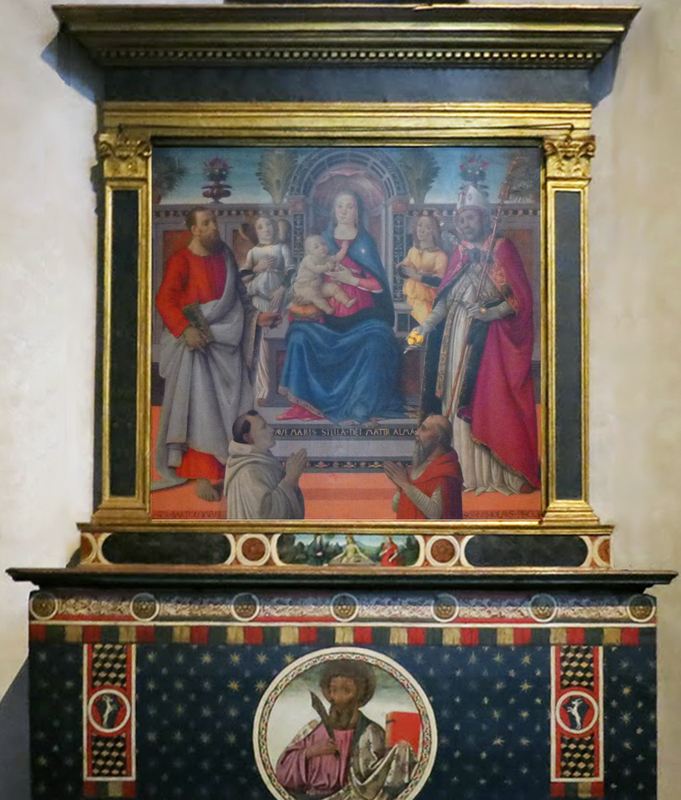 It is interesting to note that most of these 15th century frames do not have pedestal bases which break forward beneath the pilasters, as in later examples; in this one from 1483, for instance, which is for the Pollaiuolo altarpiece in San Gimignano. These types of frames are properly called ‘entablature frames’ but are often referred to as ‘tabernacle frames’; although to my mind, these usually refer to smaller domestic examples, such as the one above, which often incorporate an apron beneath the frame. The use of the word tabernacle probably derives from the wall-mounted marble surrounds of actual tabernacles, that is, the place where the consecrated Host was stored in the Catholic liturgy. 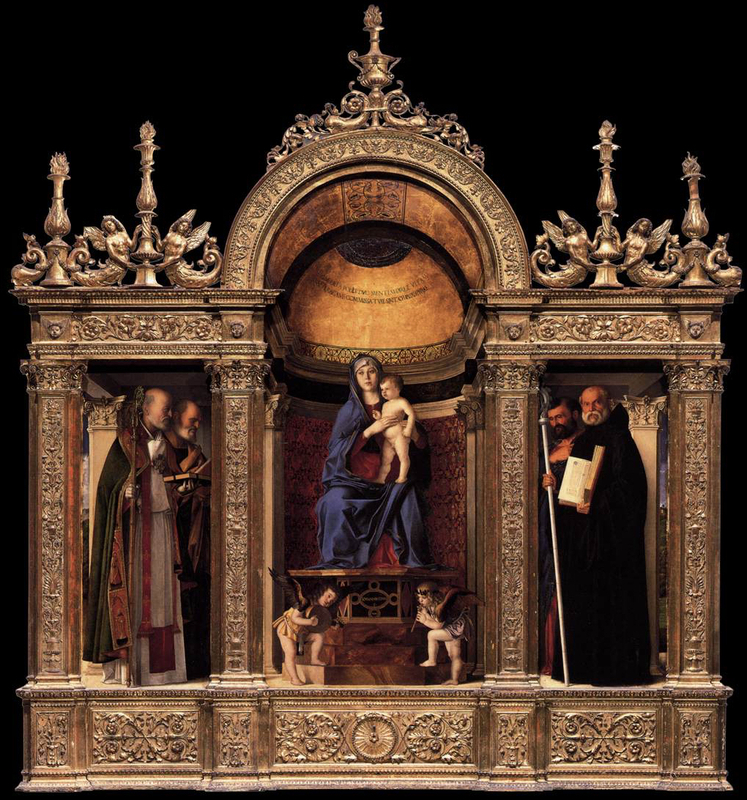 This famous example of a tabernacle by Desiderio da Settignano in San Lorenzo illustrates the structure – although the arrangement of elements as it stands here is not necessarily correct. 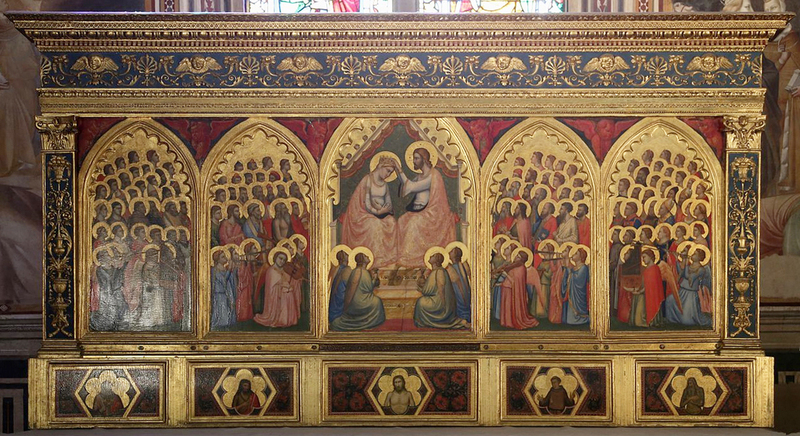 The tabernacle had originally been incorporated into a rood screen, or ‘tramezzo’ in Italian. It was dismantled when the tramezzo was removed from the nave, and no record has yet come to light to confirm the original configuration. Several scholars have questioned the present arrangement. What concerns us here is the central section with the door, now missing, at its centre, which formed the actual container for the Host. By the 1480s, the predominance of the new classical style was taken for granted. 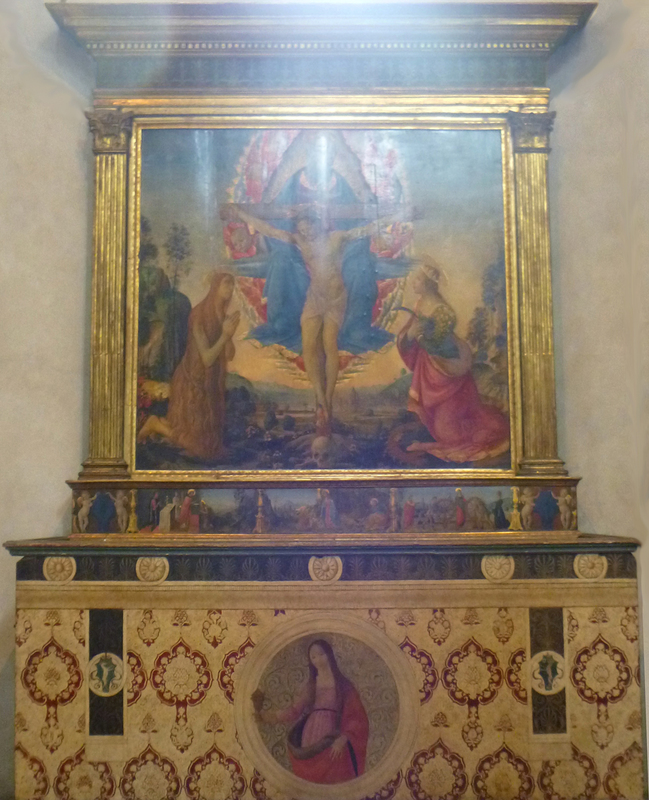 This example designed by Guliano da Sangallo in 1485 is in the Sassetti Chapel of Santa Trinità in Florence. 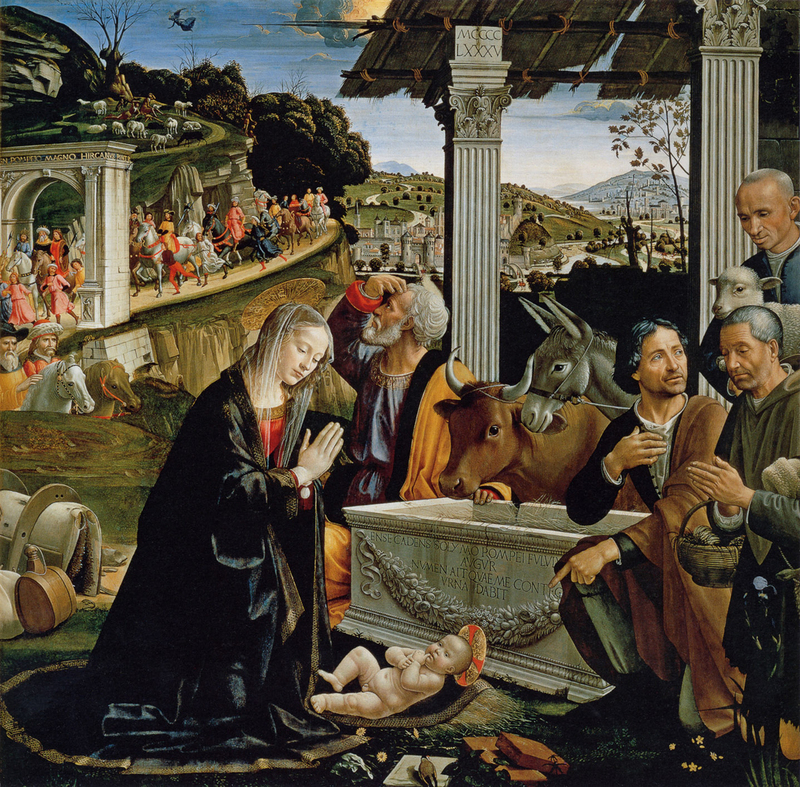 In the painting it contains, by Domenico Ghirlandaio, even the traditionally rustic stable where Christ was born is now depicted with fluted classical pilasters, and the trough from which the animals feed is a Roman sarcophagus. 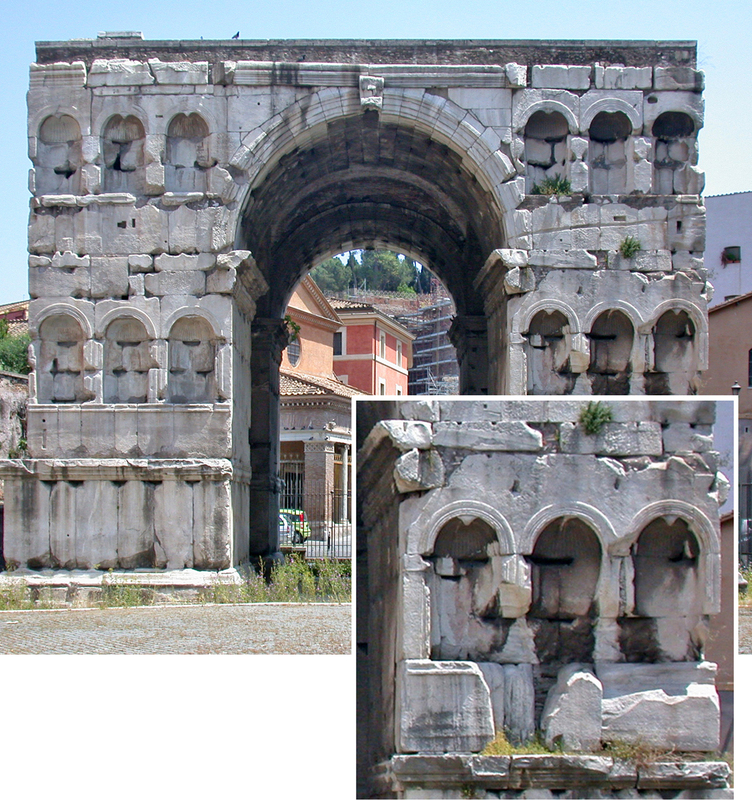 The procession in the background even winds through a Roman triumphal arch much like the Arch of Titus. 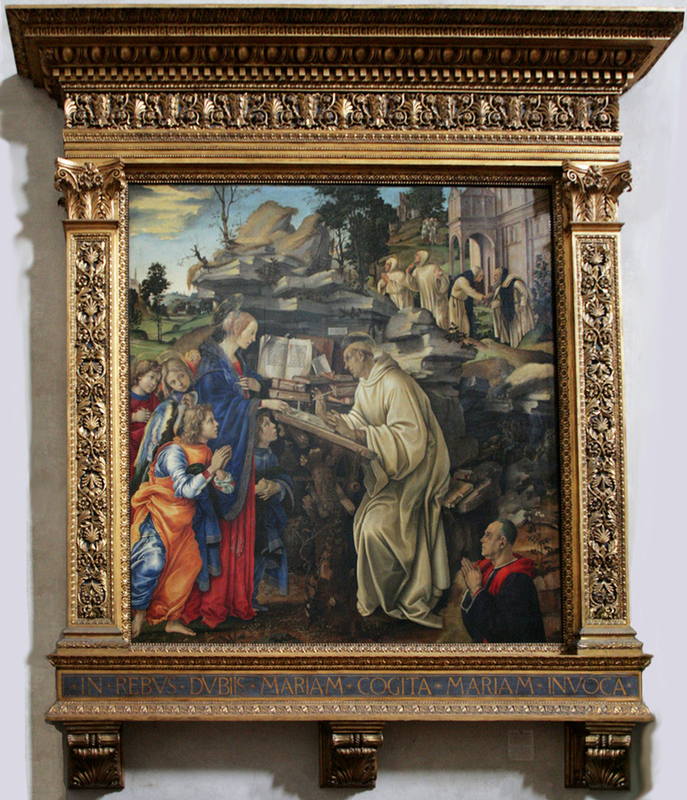 This is another example from the 1480s on Filippino Lippi’s great Vision of Saint Bernard in the Badia Fiorentina. 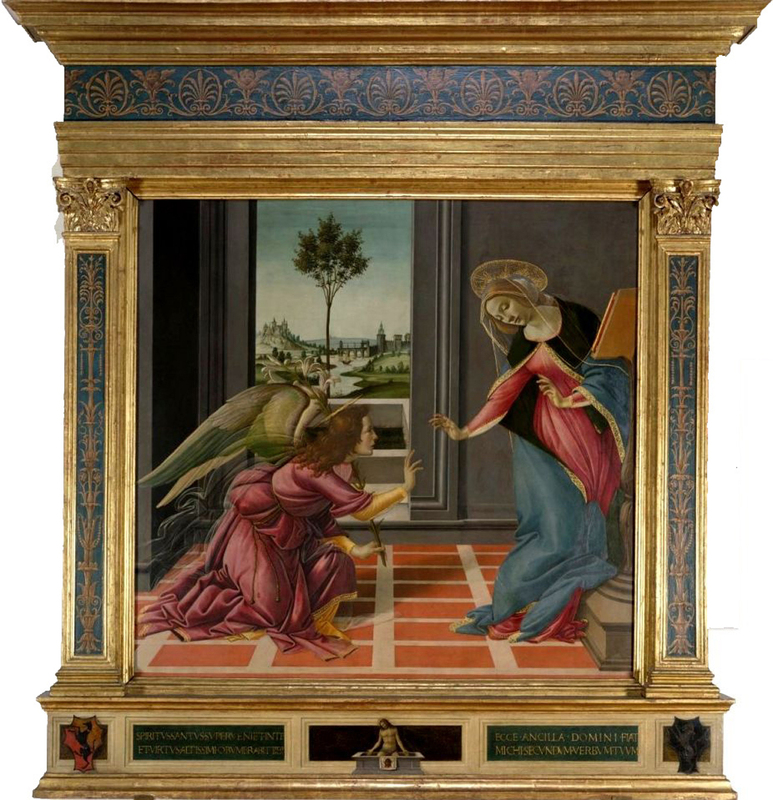 Notice the deep carving of the decorative motifs on the pilasters and frieze of the Lippi, as contrasted with this elegantly restrained contemporary version on Botticelli’s Annunciation of 1489 at the Uffizi, commissioned for Santa Maria Maddalena dei Pazzi. It should be mentioned that the simplification to an uninterrupted rectangular format was not merely a function of the changing architectural taste; it also served a growing need to bring narrative painting from the predella up into the primary pictorial plane. Technically, it served another innovative function: the fabrication of the frame and the panel as two separate and independent objects. This allowed them to be made simultaneously, shortening the fabrication time and making the construction more efficient. For the first time, the panel could be inserted into a routed track behind the inner sight edge. The ‘rabbet,’ as it has come to be called, could then mask the space necessary for the eventual expansion and contraction of the panel. This is nothing less than the birth of the modern picture frame. 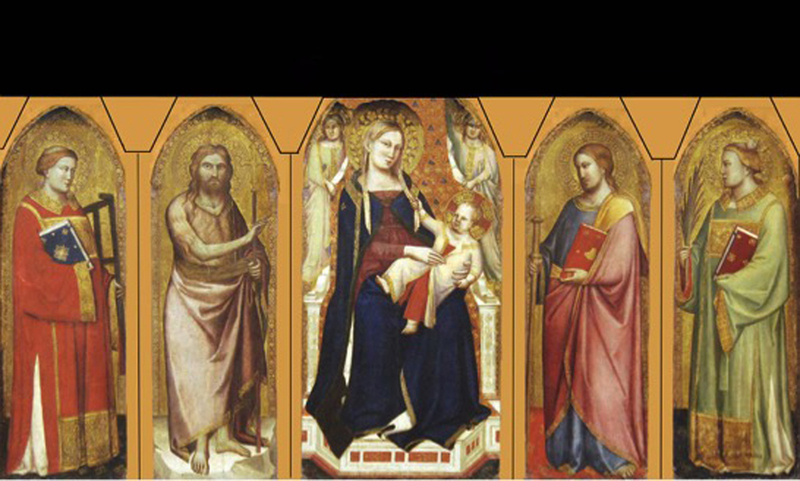 The purpose of this extended introduction has been to explain why this curious and ultimately unsuccessful re-framing of Gaddi’s Madonna enthroned… encapsulates a larger story about the transition from Gothic to Renaissance and the evolution of architectural frames. This evolution was centred in Tuscany; it took a little longer to reach the outlying regions of Italy – such as Venice. 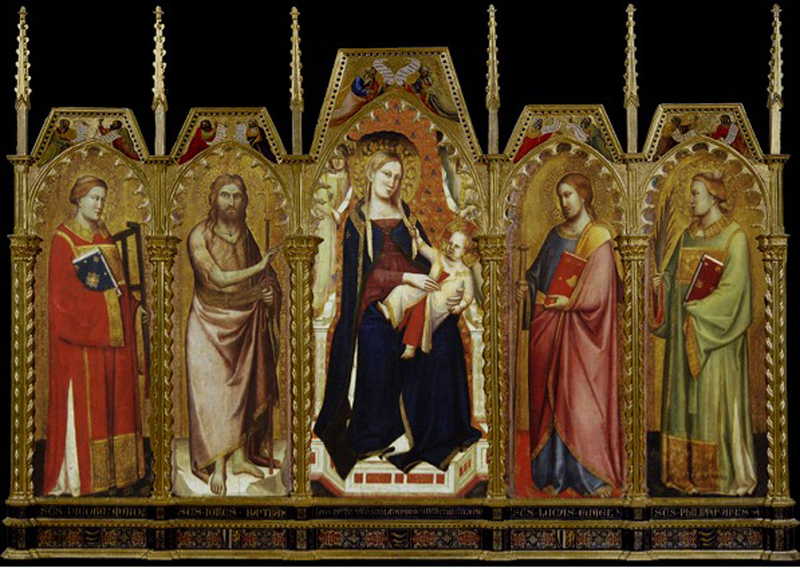 Bartolomeo Vivarini, for example, is still producing florid Venetian Gothic altarpieces in 1474, such as the San Marco Altarpiece in the Frari. Eight years later in 1482, however, he has finally moved on to the new classicizing style – this example is also in the Frari. 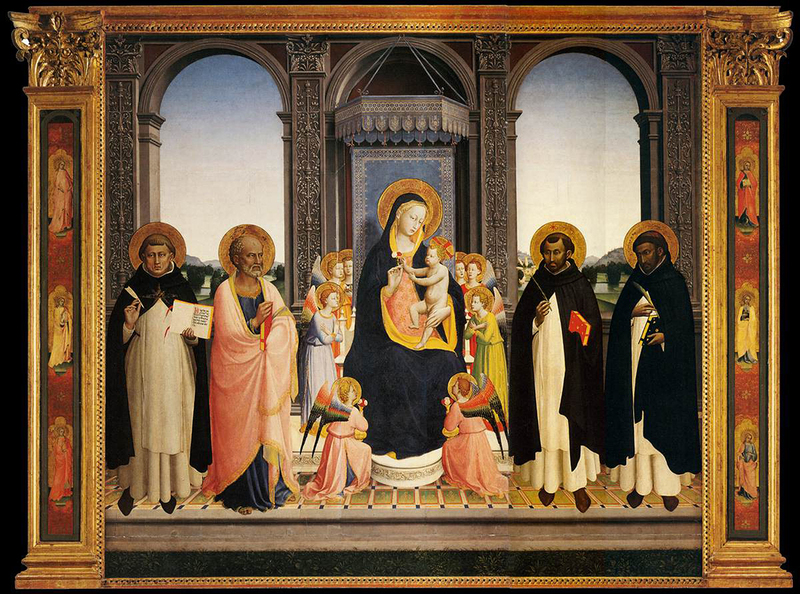 Much of the credit for the adoption of this style in Venice should probably go to Bellini, who had already produced the San Vincente Ferrer altarpiece in San Giovanni e Paolo in 1464 . 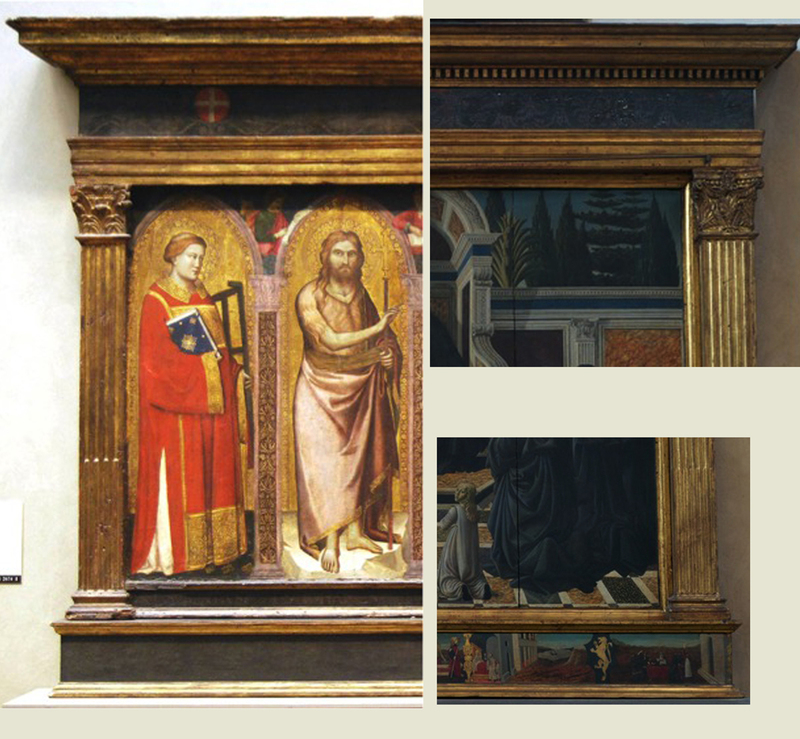 The treatment of the San Vincente Ferrer frame is decorative and superficial, but by 1488, in the sacristy of the Frari, Bellini has integrated his triptych frame with plausible fictive architectural spaces within the painting, something he continues to refine in successive years. 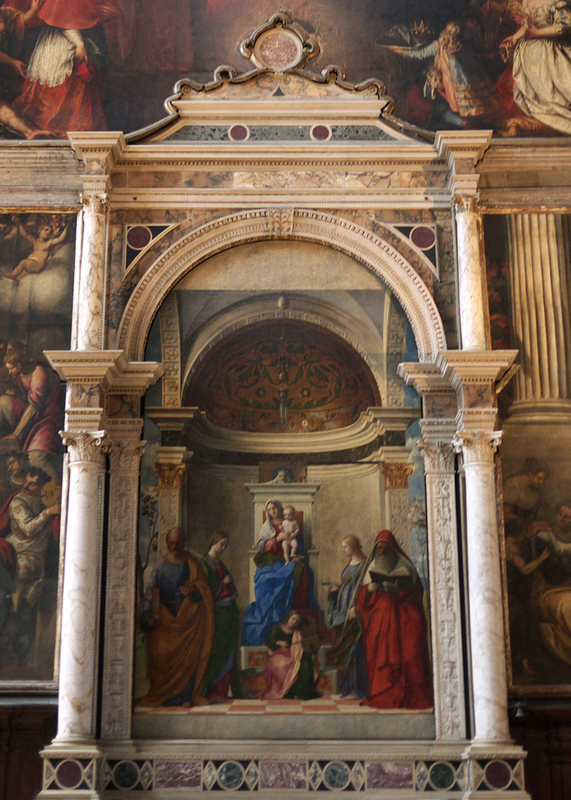 Here, finally, is Bellini’s San Zaccaria altarpiece of 1505, where the stone framing elements and frieze continue into the painting: the apotheosis of the Renaissance classical frame. George Bisacca has been Conservator at the Metropolitan Museum of Art since 1983. He is also co-chairman of the Getty Panel Paintings Initiative, and – with Timothy Newbery and Laurence Kanter – the author of Italian Renaissance Frames (1990), the invaluable book/exhibition catalogue based on the Met’s own collection. Although out of print, this can now be downloaded from the Museum’s website. 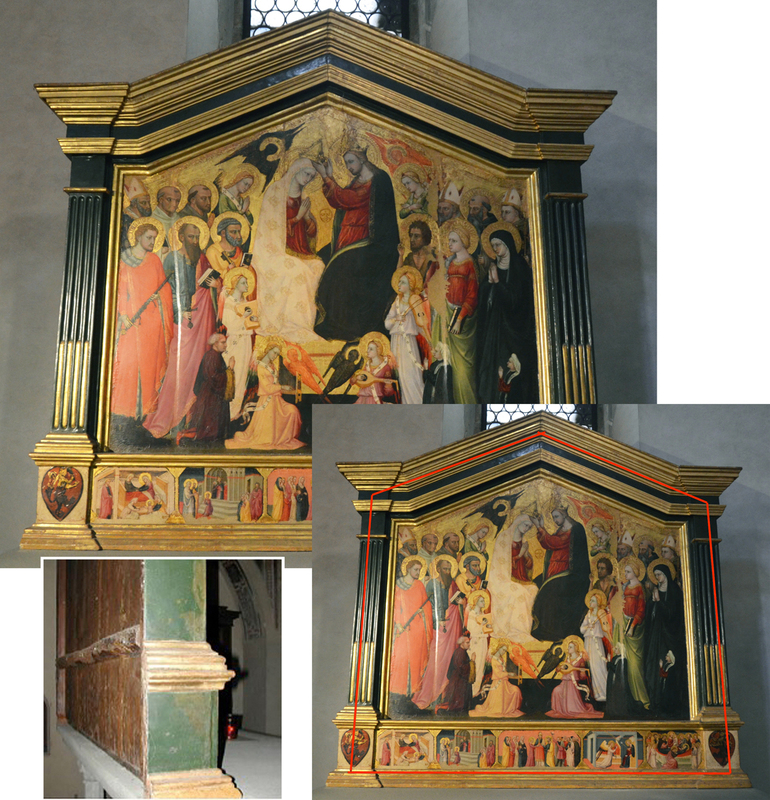 See W.R. Rearick, ‘Restoration of Polyptych of Saint Vincent Ferrer, in Santi Giovanni e Paolo’. How very interesting. 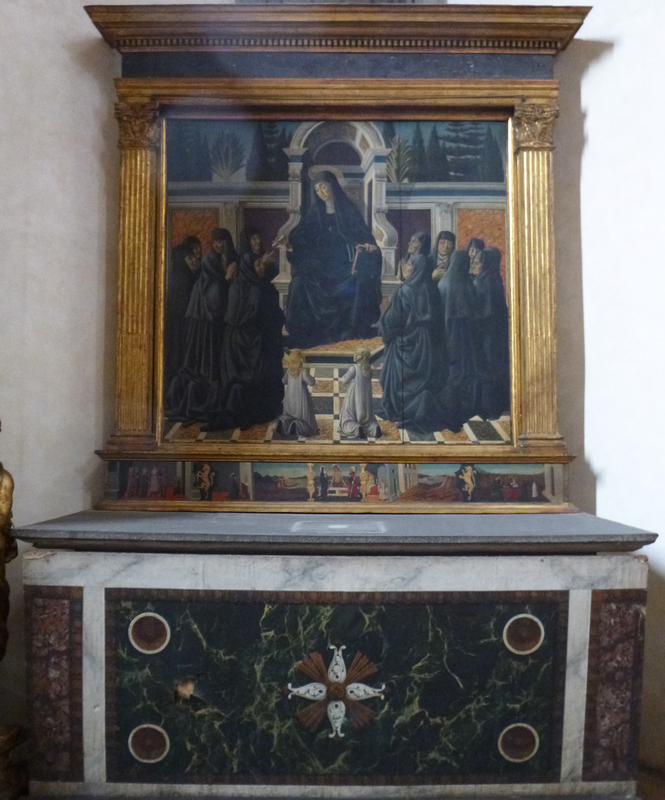 I had been roaming around, looking for a photograph of the alterpieces in Santo Spirito to see the egg white varnishes and effects of such, and stumbled onto your lovely site. I have always been as interested in what surrounds a picture as the picture itself and rarely find much information on the frames. This certainly feeds that curiosity and I look forward to reading more! Thank you so much! Oh, I think there is plenty on your site to keep me engrossed and learning for a long time! I wish I’d have come across your blog before my recent trip to Firenze. Although, now I have a very excellent reason to go back, don’t I? (Not that I need one!) You’ve done a wonderful service to all lovers of art framing! 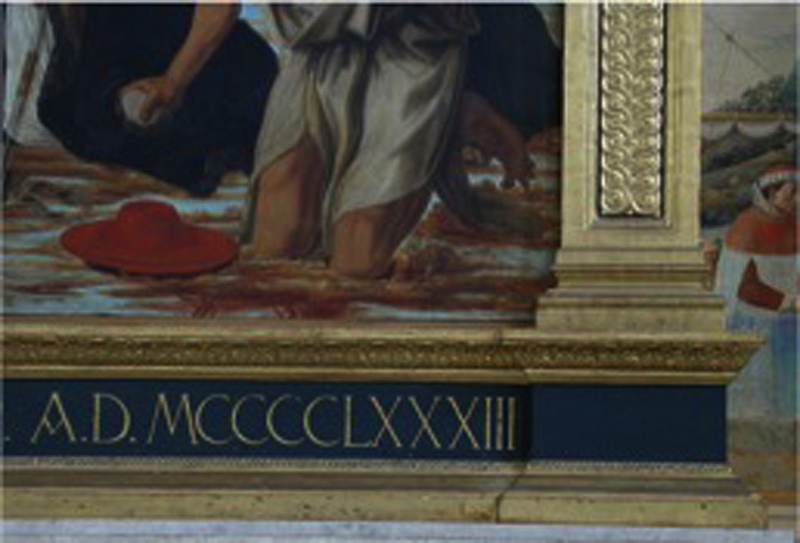 I did learn that the egg wash varnishes on the Santo Spirito pictures were cleaned in 2011. Pity. I found photos, but you are correct, the internet is a rather bad viewing medium to discern the difference. In any event, I will enjoy learing from you and will look forward to more. Thank you so much. Thank you again! 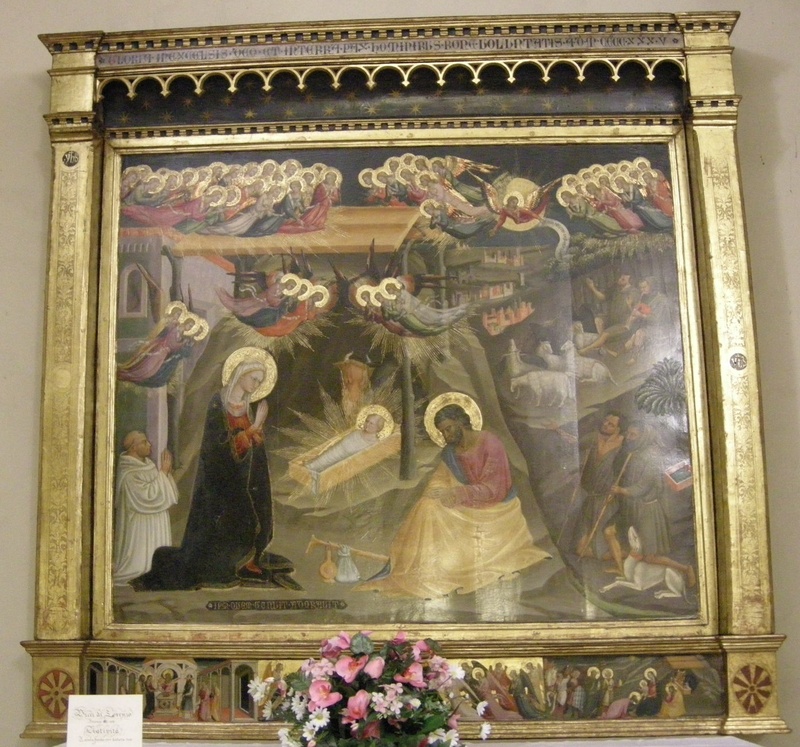 I’m very glad if some of these articles have been helpful – and I do always welcome good photos of frames on paintings, if you are anywhere in Italy (or elsewhere) off the beaten track. The frames still tend to be excised from photos, so it’s far more difficult to get the image needed of the whole work than of the painting itself. Sadly, people (even – or especially – art historians) have been brought up/trained to think that the frame doesn’t matter, although there were very few periods until the later 20th century when the artist or the client wasn’t vitally concerned with how the work as a whole would look, and how it would fit into an interior or collection. We have lost so many beautifully carved frames because of this – along with the glazes and varnishes on the paintings. I found a little mistake: The image of the Ospedale degli Innocenti actually doesn’t show Brunelleschi’s building but the Loggia of the Confraternita dei Servi di Maria, a later construction, mirrowing the hospital just on the opposite side of the piazza. Bruneleschis building is easily recognizable by the blue and white ‘bambini’ roundels of Andrea della Robbia.